I had a lunch yesterday in London with friends from Genesta Battlefield Club and was introduced to Keith Collman. 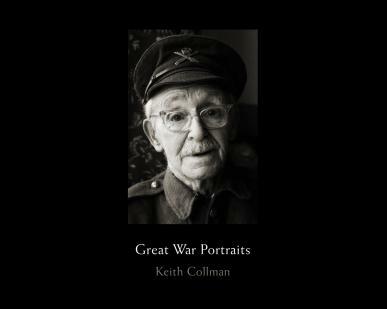 Keith is a photographer with a keen interest in Great War veterans. His face seemed familiar and as he pointed out to me that we had met on a battlefield trip to Ypres in 2002 the recollections of that trip slowly came back to me. Keith had been travelling with us when we had taken Jack Davis, Harry Patch and Arthur Halestrap back to Ypres for Armistice commemorations. I recalled that he has been snapping away through the trip so wasn’t surprised to hear about his photographic project. For the past 25 years he has been taking black & white portrait photographs of veterans. He realised that he had a remarkable collection and that he had better preserve these for posterity. (He mentioned that his children wouldn’t know what all the negatives were and would probably bin them on his demise!) The result of his endeavour is a superb book entitled ‘Great War Portraits’. I bought a copy (priced £25) and it is a lovely quality book to flick through – a real tribute to these remarkable gentlemen that we all owe so much to. Some of them I had had the pleasure of knowing, some I had never met but seen on TV documentaries whilst there are others whose faces were new to me. All are beautifully photographed and there are good details of all the men featured. Keith has only produced 1000 copies and hopes one day to be able to get his money back – it is certainly not a profit making venture. His website http://www.greatwarportraits.com/ gives a really good idea of the quality of product and is a very nice read in itself. Highly recommended for those who want a memento of these wonderful men. This entry was posted on Sunday, March 7th, 2010 at 7:49 pm	and is filed under Books. You can follow any responses to this entry through the RSS 2.0 feed. You can leave a response, or trackback from your own site.